Cerro de Monserrate rises 10,000 feet above sea level. 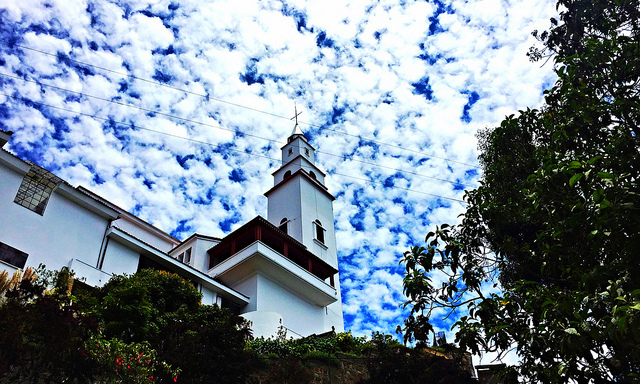 On top, a church, that was built in the 17th century, along with a shrine dedicated to “El Senor Caido” looks over the old town and La Candelaria neighborhood. The views from the top of the mountain are unreal, making it a popular destination for tourists and locals alike. The top can be reached by aerial cable car, funicular or by walking up the steep and winding path. Be warned, it’s essentially vertical in most places and takes at least an hour. However, as a Colombian pilgrimage for thousands of years, walking each of the ~3,000 steps up Monserrate is an extremely unique experience. Choose to ascend/descend by foot, cable car or funicular (that has been operating since 1928)!